Carnaval in Rio is one of the biggest and most famous parties in the world. But nowadays the hip tourists prefer Salvador and many Cariocas leave the city to celebrate Carnaval in a more relaxed atmosphere. The mais attraction in Rio has traditionally been the parade of the samba schools in the custom built Samb?dromo. More informal parades in the various neighborhoods are now promoted to compete with Salvador. All the normal hotspots in the city heat up even more during the four days of Carnaval. The big parade is not a chaotic sequence of scarcely clad mulatas as the TV-coverage in Europe might suggest, but a highly formalized and extremely well prepared sporting event. Each year 14 samba schools fight for the title of best parade. Every aspect is judged: from costumes to drumming. The schools choose a theme (enredo) for that years parade. This theme is used in the text of the samba in the costumes and in the floats. The themes vary hugely. In 2005 the winner Beija-Flor represented the Jesuit presence in Brazil. While my personal favorite Imperatriz worked with the fairy tales of Hans Christian Andersen, helped by a financial injection of the Danish government. Other schools where sponsored by Pertrobras and Nestl?. It probably won?t be long before the whole parade has been turned into a giant commercial. he parade starts with a Commiss?o de frente. This used to be some elderly school members waving to the crowd. In the last years they have evolved into choreographed dance spectacles with swans (Imperatriz ) or Roman soldiers (Beija Flor 2005). They are folowed by groups of people dressed in the same costume (this is called an ala) and up to eight floats. The drum section and singers usually close the parade. All together a school parades with up to 5.000 people. This means that each night over 30.000 people are parading, watched by 60.000 crowd. Both groups mix on their way to the Samb?dromo. In the Metro you already see a fair sample of the costumes on display that night. The samba is rehearsed one last time, to make sure everybody can sing along. Around the Samb?dromo there is an even bigger frenzy: scalpers selling tickets at inflated prices, spectators looking for their section, and paraderd looking for their school. Mixed with street vendors that are always present if more than 10 people gather. Each school has a few destaques that wear the most elaborate costumes or nothing but a bit of paint, and get the best spots on the floats. To become a destaque you don?t just have to be beautiful and able to samba but also famous. And if you’re famous enough the other demands are dropped. As is shown by the presence and rapturous reception of 63 year old actress Suzana Vieira. Naomi Campbell on the other hand wasn?t recognized and paraded as just an other beautiful mulata. If a school delivers a great parade, all the elements mentioned above blend together in a sea of color, movement, music and dance. And the public feels part of the parade as well, like you can feel part of a great rock concert. After 80 minutes the show is over, and there is no possiblity of an encore. You just have to wait for the next school and hope that it is just as good. 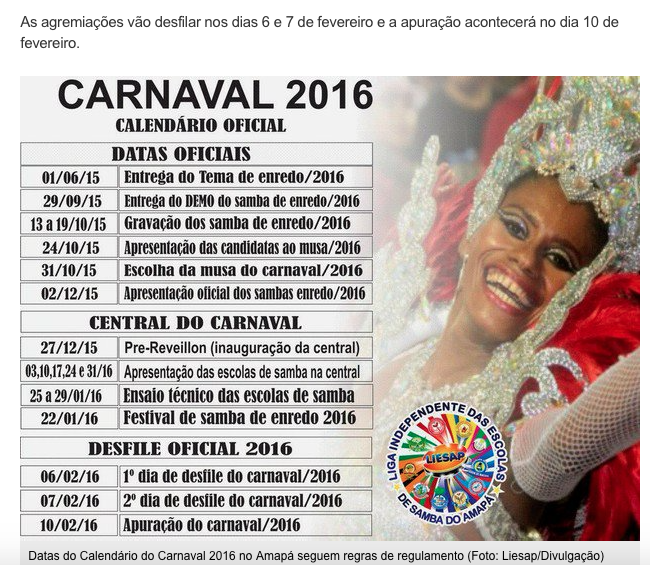 The 14 best schools (Grupo Especial) parade on sunday and monday of the Carnaval weekend. With seven schools a night and 80 minutes per school, the program lasts until the following morning. On monday the last school Beija-Flor paraded in the sun, due to delays caused by Portela. By then the public had already proclaimed Imperatriz their favorite. The various newspaper each have their own trophy. But the all important official winner gets elected on wednesday. In a live television broadcast, much like the Eurovision Songcontest voting, 40 jurors give their marks from 1 till 10. In practice the majority of the votes vary between 9,5 and 10. The 2005 winner Beija-Flor just missed 0.6. Unidados da Tijuca followed on 0.1 point. The six best school parade again on saturday in the Champion?s parade.